It’s looking like we won’t need Gary Johnson on the ballot to Naderize Trump. I drove a limousine in San Francisco in the early eighties and listed myself as able to give tours in French, German, and Spanish. There were some interesting moments like the time i got an order to give a city tour in German. When i arrived at the concierge desk at the St. Francis, i didn’t see anyone who looked like they might be my clients, so i told the concierge the name i’d been given and was directed to a couple of women in saris. Well, yes, a lot of Indians emigrated to this country, but quite a few went to Germany and of course learned German rather than English. Still, there was great cognitive dissonance in speaking German with folks in saris. But by far the best limousine language moment started another time i was waiting for walkups at the airport. I was called to the limousine desk for some Spanish-speaking clients, who turned out to be a middle-aged Chinese couple wanting to go to Walnut Creek. I chatted with them on the way and learned that they were restauranteurs from Peru and were on their first trip to the United States to see his brother, who’d emigrated to this country many years ago about the same time they went to Peru. His restaurant had also been successful and he’d just moved into a new home. When we got to Walnut Creek i stopped to consult my map only to discover that there was no such address. Luckily, a fire station was in sight, and firemen know all the newest streets. Sure enough, the address was in a brand new subdivision, and i got there with no problem. Having already been a little traumatized at the airport and by my having to stop at a fire station for directions, my clients remained cautiously in the car while i went up and rang the doorbell. To my great relief, the man who answered was Chinese, and when i told him his brother was here, he raced out to the car for a joyous reunion in rapid Cantonese while i unloaded all their luggage and carried it to the front door. Time to settle up, so i delicately excused myself in Spanish to the Peruvians. He paid me, and i thanked them and wished them a very enjoyable visit to this country. And at that moment i noticed out of the corner of my eye the American restauranteur standing there in slackjawed amazement at the utter, ineffable wrongness of this white driver being able to stand there right in front of him, chattering away with his brother in a language he could not understand. The only way it could have been worse would have been for his brother and me to have been speaking Mandarin. 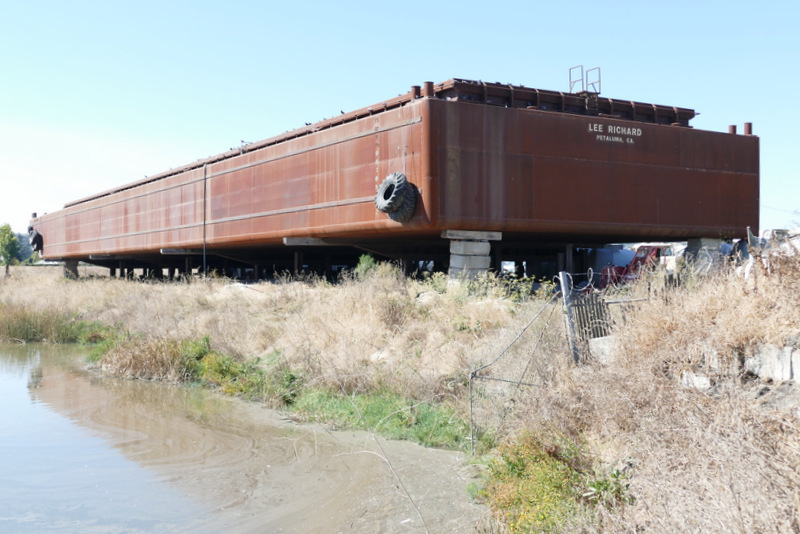 Meanwhile, totally changing the subject, here’s a fascinating old barge i recently spotted off Hopper Street on the banks of McNear Channel. Anybody have any information on this thing? All i’ve found when i searched on “Lee Richard” is a couple of images with no text. Surely there’s a story here. Does anyone know anything about it? Another question is, how the heck did it get up there? Must’ve been by crane, eh? Looks precarious, sitting on those little concrete blocks. The more i look at that thing, the more questions i have. I mean, it didn’t just wash up there!